Hi everybody! 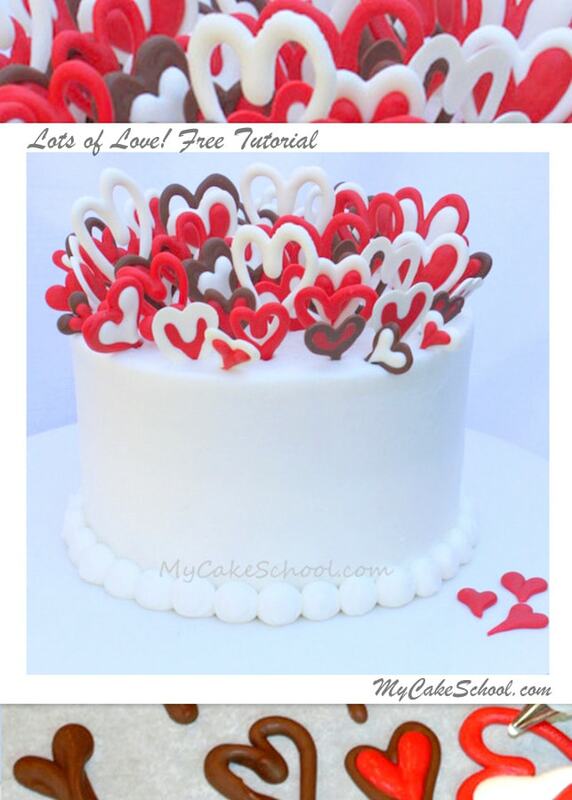 I had the best time today working on this Valentine’s Day cake tutorial with simple chocolate hearts! Lots of them! The idea is really very simple. 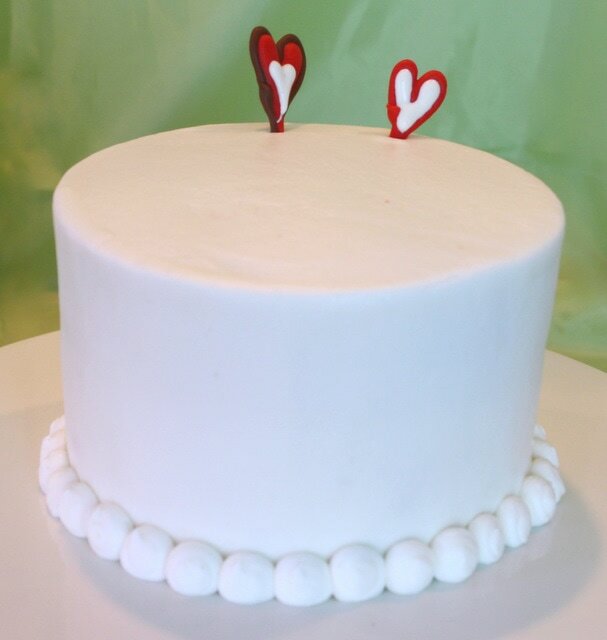 I started with a “plain jane” cake…just a 6″ round frosted in vanilla buttercream with a quick ball border (tip 12). The fun part came when it was time to melt the chocolate! For this project, I used chocolate candy coating . 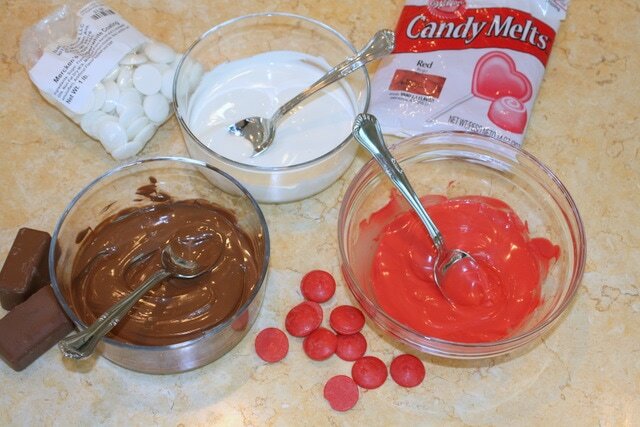 Here’s a picture of my melted red candy melts, bright white merckens candy coating, and some chocolate “bark” coating. Any variety of candy coating or melts would work with this cake. This is just what I had on hand. You may want to consider the shade of your candy coating vs. the shade of your buttercream. For instance if your coating is a bright white and your vanilla buttercream is more yellow (or vice versa) you may be happier with either chocolate frosting or pink frosting for a nicer contrast. My candy coating and frosting were about the same level of white and so it worked well. Next, I spooned my melted chocolate into piping bags fitted with a tip 3. You could also just snip the end off of your parchment cones, but I feel like I have more control when using a piping tip. 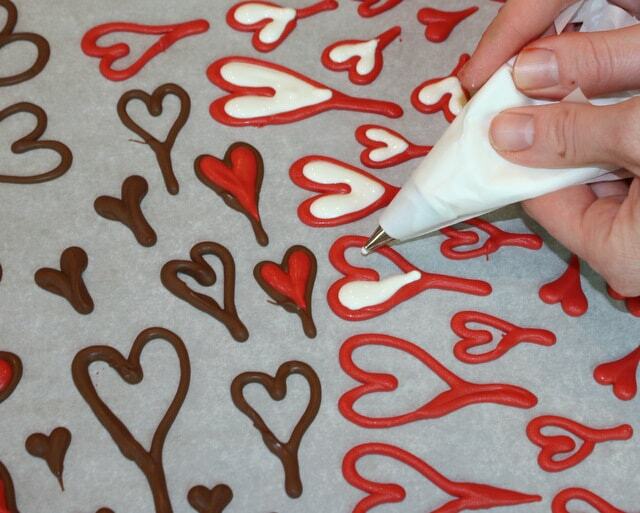 I piped many, many hearts with “stems” onto a parchment-lined cookie sheet. I kept my bowls of melted chocolate in a warming drawer so that they wouldn’t set before I had a chance to use them. You could also just melt one bowl at a time as needed. 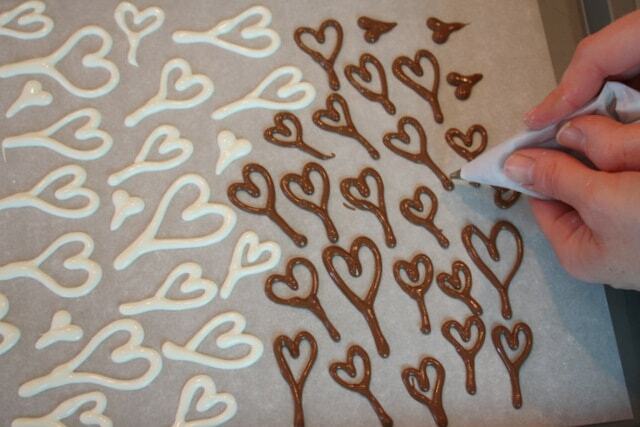 You can put your cookie sheets (chocolate hearts and all) into a freezer for a few minutes to set. After doing this, I decided it would be fun to fill some of my open hearts with contrasting colors of chocolate. Then a put in the freezer for a few more minutes until they had set. After the hearts have set….the fun begins! 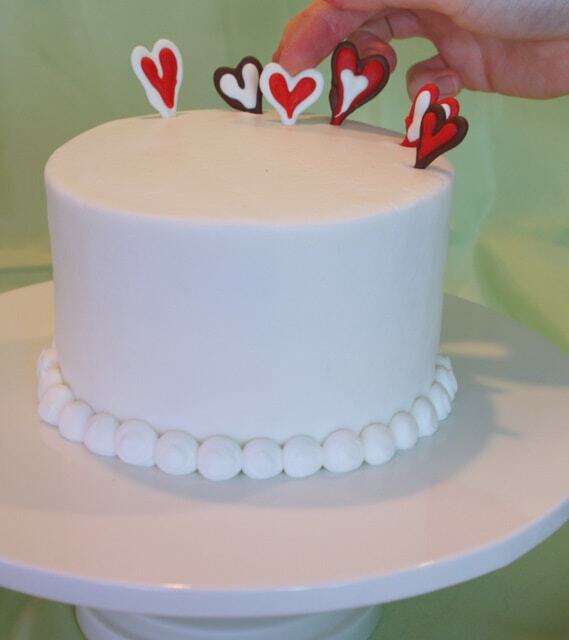 I let the other hearts continue to chill as I pulled out a few at a time to place onto the cake. Hooray! It’s a heart explosion! This cake makes me smile. We hope that you’ll give it a try! 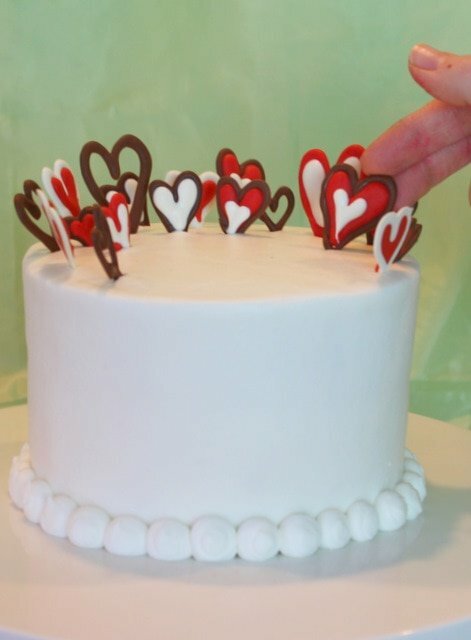 The little chocolate hearts would be adorable as cupcake toppers too! 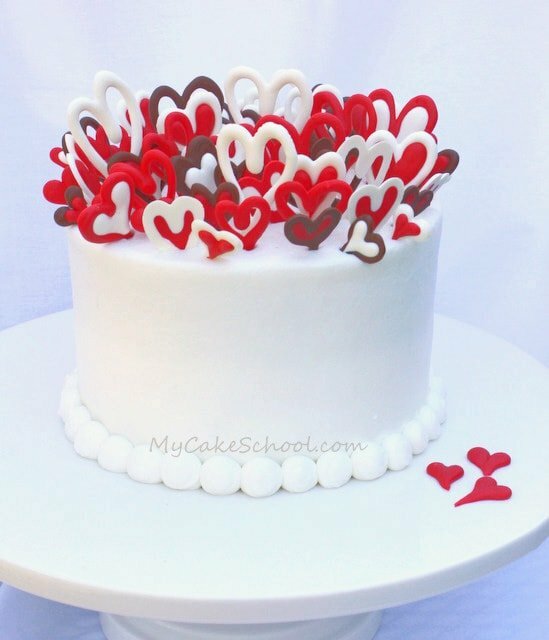 Make this cake for a few of your favorite people this Valentine’s Day…or any day! Valentine’s Day Cake and Cupcake Tutorials by MyCakeSchool.com. -Makes me smile too! Wonderful – thanks for the inspiration! Wow i’ve never seen a cake decoration like this before! This is so creative. I will definitely try this. This cake is adorable and easy to make. I love it! Loving this cake, thank you , will be making this one …. Other alternatives for the color candies if I can’t find the same ones? Thank you. This is a wow idea n a wow cake, thanks for such brilliant idea, I’m gonna make for hubby.